Monday, July 4th, 2016, News. Here’s a listing of my upcoming July shows. 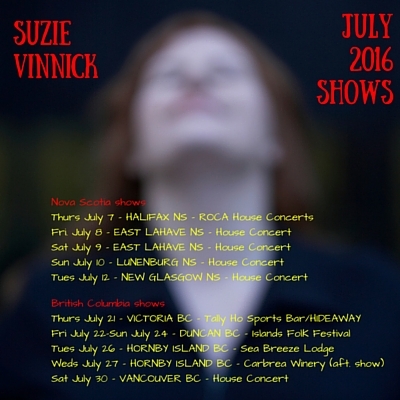 I have a few weekends open in August (5-7; 12-14; 26-28) so if you’ve been thinking of presenting a house/backyard concert and you’re within 6 or so hours of Toronto please feel free to drop me a line at suzie@suzievinnick.com to see about having me come play for you and your friends!